If you're in need of a reliable, cost effective heavy haulage provider in Brisbane, speak with the specialists at Cargoconnect today. With a team of logistics on hand 24/7 to support your business, Cargoconnect are the logical choice when it comes to all things freight and logistics related. 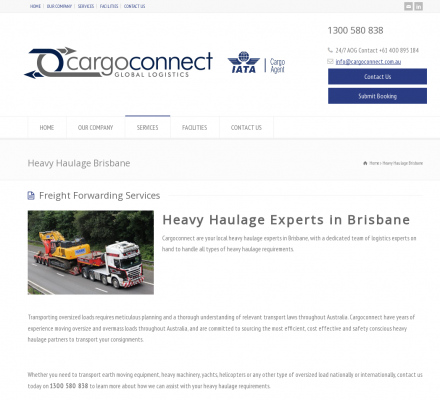 Description: Business, Transportation and Logistics - Cargoconnect Heavy Haulage Brisbane. If you're in need of a reliable, cost effective heavy haulage provider in Brisbane, speak with the specialists at Cargoconnect today.